Abercrombie signs legislation aimed at helping Hawaii draw up a response to sea level rise in the islands. To address Hawaii’s vulnerability to climate change, the state has taken what advocates say is a key step toward responding to coastal flooding, erosion and decreased supplies of fresh water. Gov. Neil Abercrombie signed House Bill 1714, now known as Act 83, to fund the collaboration of various Hawaii agencies and community members to gather information on areas of the state that will be most affected by sea level rise. 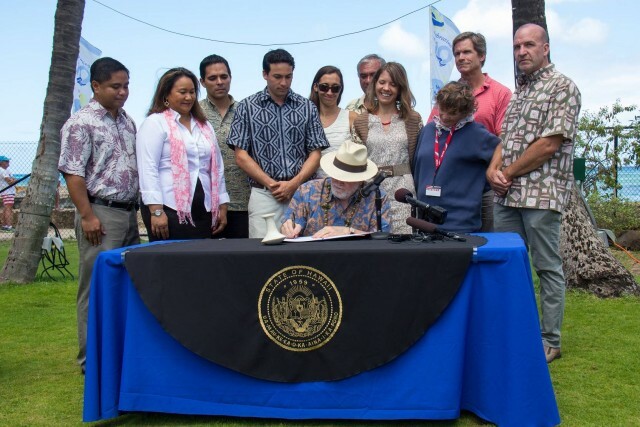 “I believe that this bill today provides a road map for Hawaii to be able to deal with the questions of climate change and global warming” Abercrombie said at the June 9 bill signing at Waikiki Aquarium. Gov. Abercrombie signs HB 1714 into law at the Waikiki Aquarium on June 9. That “road map” would create an interagency committee of county and community representatives, overseen by DLNR and the Hawaii State Office of Planning, to assess and make recommendations about how best to prepare for rising sea levels and their secondary effects. The committee is required to issue a report that will be available to the public before the end of 2017. This isn’t the first time a climate adaptation bill was proposed in Hawaii. In 2009, SB 266 proposed the creation of a climate change taskforce that would perform many of the same functions as HB 1714, but would focus more generally on assessing the broad effects of climate change. SB 266 was never funded. With the governor’s signature, HB 1714 will be funded, noted Richard Wallsgrove, the Blue Planet Foundation’s program manager, and that should make all the difference. “This bill has really taken the bull by the horns because it’s got the funding,” he said. While the new law formally creates the committee, it isn’t entirely clear who will be on it. Members may include Department of Planning representatives from various counties, a representative of the Attorney General, Hawaii’s departments of Transportation and Health, as well as members of the general public, according to Nathalie Morison, a program planner at the Office of Planning’s coastal zone management program. DLNR First Deputy Jesse Souki gave Civil Beat a sense of what sea level mitigation strategies might look like in the islands. “There are a suite of options we have, it might be enforcing our structures on the coastlines with engineering solutions,” Souki said. Hawaii will need to prepare for changes and not just to sea walls; entire communities will have to reconsider their proximity to the ocean, he said. Sea levels are projected to rise one foot by the year 2050 and three feet by 2100, according to scientific forecast models from the Intergovernmental Panel on Climate Change and the National Academy of Sciences. Such models say that island states like Hawaii are particularly vulnerable. “The state of Hawaii is probably more vulnerable to sea level rise due to climate change than any other U.S. state aside from Florida,” said Paul Selmants, who is a junior research faculty member at UH Manoa. HB 1714 builds on SB 2745, which was signed by Abercrombie in 2012. That bill, which was an amendment to the Hawaii State Planning act, required agencies to pay special heed to how their actions might exacerbate or be exacerbated by climate change. On the county level, there have also been efforts to respond to climate change. Hawaii, Kauai and Maui counties all bar development from taking place directly on shorelines.